The Tennessean recently published a feature with five related stories on Nashville megachurches and their pastors. One of the five congregations featured was the Iglesia de Dios church on Trinity Lane, pastored by Jose Rodriguez. According to the story about Iglesia de Dios, the congregation is 3,000 strong in a building built for 800, so there are 5 worship services on Sunday. There are also 5 satellite congregations. The church was founded in 1995, a year after the Rodriguez family came to Nashville from Venezuela for their son's medical treatment. According to an article in Latino-News.com, the family is from eastern Venezuela, in the Tigre municipality, Anzoátegui province. Pastor Rodriguez has degrees in divinity and psychology. He and his wife Vilma have five children: Erick Israel, Adriana, Josué, Moisés and Raquel. Earlier this month, the church held a soccer tournament in Nashville called "Copa Vida" (photo gallery here) and a youth camp in Chattanooga called "Superheroe" (photo gallery here). Both the Tennessean and Latino News report on the church's plans to open a new building on Dickerson Pike later this year. Three months ago, the church made a video tour of construction progress. The most recent episode of Somos Vida is below. 1) Michelle Peterson (michelle.peterson@nashville.gov), Assistant Director of 911 Emergency Center will describe how 911 handle calls from speakers of languages other than English. She will also tell the Task Force about the new initiative named "SMART 911", and how the language-line will be introduced to the public. Angie Harris, ESL/TESL Director at TFLI will announce information about TESL scholarships to train ten volunteers who currently teach ESL to become certified TESL instructors for adult immigrants and refugees who are learning English as a second language in Davidson County. The grant is from the Nissan Foundation. *There will be additional time for other brief announcements and networking. Elvis, Shakira, Pitbull and the Beatles. 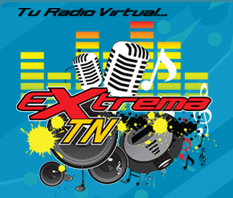 EXTREMA TN, the passion project of Venezuelan-born Nere Vargas and Mexican native Rigoberto Velasco recently launched, offering Music City a multicultural, multigenerational, bilingual choice for Internet radio. It all began last November in a Nashville bilingual café when a public school Spanish teacher asked Vargas where students could listen to Spanish music to learn the language. Vargas named local AM stations, but on the ride home, she realized a need. She recalls telling Velasco: “All those stations play regional Mexican music, but they don’t play music from other Latin American countries and cultures.” Rigo agreed. He said since there wasn’t such a station, they’d create one, and EXTREMA TN was born. In our native countries we listen to English music, classic songs no matter how old they are like 'Hotel California,' and 'Let It Be.' We listen to classic artists like Whitney Houston, Celine Deon, Elvis Presley, Phil Collins, and Madonna, as well as contemporary artists like Britney Spears, JLo, Pitbull, Lady Gaga, and Brianna. We’ll play Latin musicians who sometimes sing in English, like Shakira and Enrique Iglesias. We will play to all age groups and support Hispanic and American local musicians since many Hispanic families have children born here as Americans. What better place than Music City to show the world our local talent. Velasco, the station’s programmer, has worked in radio almost twenty years in Mexico and the US. Vargas, owner of a printing company and the magazine 4U TN News handles is the PR and Sales Manager. While they first pursued an FM station, seeing the 2012 cars loaded with Internet persuaded them to go with the wave of the future. You can listen to EXTREMATN online at www.extrematn.com , and on the Blackberry and iPhone @ www.mobil.extrematn.com. Check the website for an application coming soon for downloading on the Android. For more information call (615) 474-6135. Writer Cindy McCain is the Nashville Latin dancing Examiner for Examiner.com. This is her second article for HispanicNashville.com. McCain says her gypsy soul trapped in a Southern body finds cultural diversity and community in Nashville's pulsating Latin Dance scene. A longtime lover of dance and travel, the English- Instructor- By- Day, Salsa-Seeker- By- Night discovered in her own backyard not just an escape hatch but a portal to a new world. She showcases this global scene where people passionately dance beyond borders, finding joy and friendship in the Athens of the South. She invites you to bachata with her in the shadow of the Bellsouth Building and merengue rather than march to a different beat in Music City. You can contact her here with comments, events, or ideas for articles. July is a month of freedom festivals. Wednesday, July 20, is Colombian Independence Day and Serenatta Romantic Latin Ensemble will kickoff one of several events in Nashville scheduled to celebrate the South American country’s liberation. 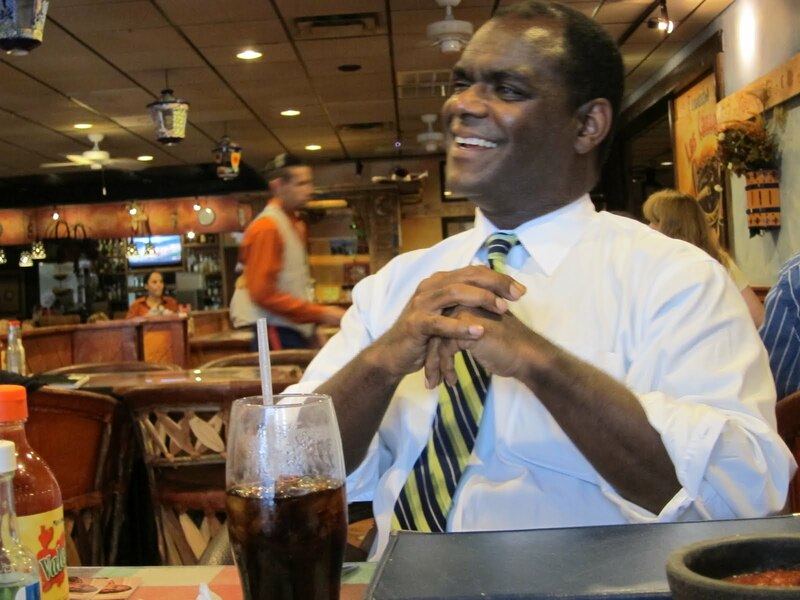 The fiesta is scheduled from 7-9 PM at Tequila's Mexican Restaurant located at 3736 Annex Avenue. Colombia has gone through very difficult times, but at the present moment the country enjoys calm and prosperity: a good feeling for Colombians to celebrate during this Independence Day. It is the opportunity to gather the Colombian community to strengthen our social links and a good excuse to have a party. For that party Garzon said Serenatta will play their Colombian repertoire and host Kendra Murray's Nashville Rueda: "They will perform cumbia, perhaps the Colombian rhythm better known internationally. “ He also thanked Luis Soto for providing the venue. 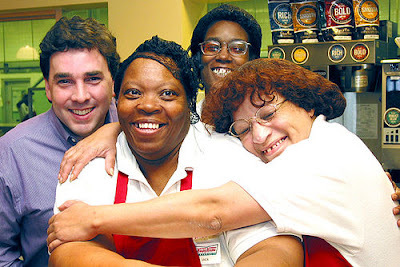 Even though Serenatta has gone through changes, it is a very stable group since 2001. This year we celebrate eleven years of existence and wonderful experiences. I started the group, without knowing it, with Jon Wolfe, friend and guitar player. When we started to practice regularly, a flute player joined in, then a harp player, then a bass player and then another violinist. The first Serenatta was formed by two violins, a flute, harp, guitar and upright bass. Through the years, every time we have a performance some musicians from the audience show interest and come to rehearsal. I want to keep my band open for all kind of possibilities. Today in 2011, I have a singer, Luna Morena; a flute player, Leslee Rose; two violinists, Craig Duncan and Benjamin Sanders; two guitar players, Joey Butler and Robert Thompson; two bass players, Lorne Rall and Sam Frazee; and two percussionists, Mike Wyatt and Larry Murrow. I am sure new musicians will come to rehearsals and join the band. The more the merrier. The discipline, dedication and love all the musicians express to play Latin American music. It is very meaningful to me to see that my musicians have embraced the music and culture of the Latin American countries with commitment. Joey Butler, one of my guitar players, has composed music for the band based upon Colombian rhythms like cumbia, pasillo and pasaje. The first time Colombian music is composed in Nashville, Tennessee! 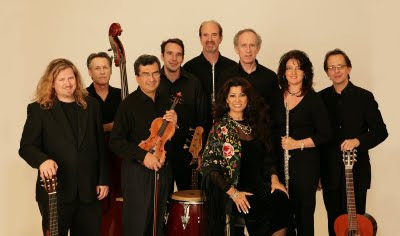 With a multiethnic gathering of ‘groupies’ (American, Mexican, Colombian, Bolivian, Jewish, Lebanese, Puerto Rican, Canadian, French, all of us living in Nashville), Serenatta Romantic Latin Ensemble hopes to continue to be an international ambassador for the enjoyment and delight that music gives to all of us. Writer Cindy McCain is the Nashville Latin dancing Examiner for Examiner.com. This is her first article for HispanicNashville.com. McCain says her gypsy soul trapped in a Southern body finds cultural diversity and community in Nashville's pulsating Latin Dance scene. A longtime lover of dance and travel, the English- Instructor- By- Day, Salsa-Seeker- By- Night discovered in her own backyard not just an escape hatch but a portal to a new world. She showcases this global scene where people passionately dance beyond borders, finding joy and friendship in the Athens of the South. She invites you to bachata with her in the shadow of the Bellsouth Building and merengue rather than march to a different beat in Music City. You can contact her here with comments, events, or ideas for articles. 12% of Hispanic students in Metro Nashville Public Schools take Advanced Placement classes, according to The Tennessean, which is reporting numbers released from the U.S. Department of Education’s Office of Civil Rights. The number is 5% in Rutherford County, according to the story. Our local paper does not report whether those numbers are trending up or down. Two years ago, the Tennessee Department of Education reported that the number of Hispanic students in Tennessee who were taking at least one AP exam was up 35%. If you asked me to pick one photo, one poem, and one quote of what the American Dream means to me, here are my choices. •	Do not make people feel oppressed, humiliated, de-energized, or belittled. •	Do not mistreat people who are less powerful than you. •	Focus on ways you are no better or even worse than others. •	Focus on ways you are similar to people, not different. I will be joining a few hundred other people to celebrate the American Dream tomorrow, Tuesday, at the fourth annual American Dream breakfast at Lipscomb University. Starting at 7:30 a.m., the Tennessee Immigrant and Refugee Rights Coalition will present the Johnny Hayes American Dream Award to Mr. Daoud Abudiab, the Welcoming Tennessee Award to Nashville Public Television, and the Face of Courage Award to Mrs. Cristina Condori. The celebration is open to the public. More information here. Fabian Bedne. Photo by John Lamb. Tomorrow, early voting starts in the Nashville Metro Council elections. I know two of the candidates personally: District 31 candidate Fabian Bedne, and at-large candidate Renard Francois. Please vote tomorrow during early voting, and please consider supporting Fabian and Renard. Fabian is a building designer who's been in Nashville for over a decade and who was born and raised in Buenos Aires, Argentina. 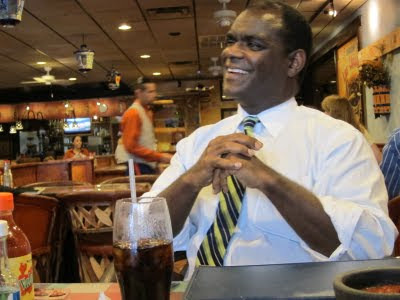 Read about Fabian's history, family, and community service over at his web site www.bednefor31.com. You can also read more about Fabian in the stories I've written about him - and some of the stories he's written himself - here at HispanicNashville.com. As long as I've known Fabian, he's been thoughtful, selfless, professional, and willing to take action to make the world around him a better place. If you live between Nolensville Road and I-24, you need Fabian as your councilman. Fabian, in turn, needs you to go out and light up his name in the voting booth. Renard and I went to high school together here in Nashville. We were roommates on debate trips. 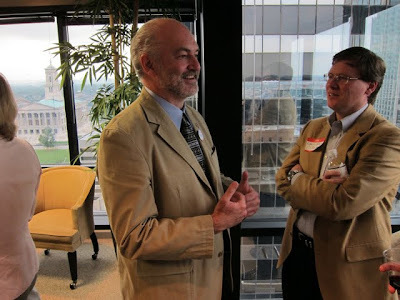 He was the class Vice President, and later he went on to work for the Federal Trade Commission in Washington, D.C. Now we work right down the hall from each other in the same legal department on West End, and I'm thrilled we're connected again. Renard is already making it clear he'll be a Councilman for the entire city - he's the anti-Crafton, if you ask me. He already knows Conexion Americas on a first-name basis, and he's the only candidate with a set of palm cards in Spanish. Anyone and everyone voting in the entire city of Nashville can vote for Renard and know that he will strengthen our city and our bonds to each other. Look for Renard's name in the list of at-large candidates on your ballot, and make sure his name is one of the five you light up. Renard Francois. Photo by John Lamb. Overton grad Mercedes Gonzalez targeted for deportation: "I'm just a normal person"
Despite all she's been through, Mercedes Gonzalez loves Nashville. "I love Nashville" were the first words out of the 2011 Overton High graduate's mouth when she told the Tennessean about being taken to jail for going 48 mph in a 40 mph zone, and after that having to walk home for two hours. I graduated from John Overton High School. I am very active at my church, I play soccer, I love to play the guitar definitely I love music as well as NASHVILLE. Because of Mercedes' speeding ticket and the federal-local immigration bureaucracy, Uncle Sam has filed papers to move Mercedes to Mexico. Mercedes' family is from Veracruz, right up against on the southern edge of the Gulf. She was brought to Nashville when she was 11. "Even though I didn’t have the choice to come to the USA I am still very grateful that they didn’t leave me there alone," says Mercedes. None of Mercedes' relatives remain there, she says. 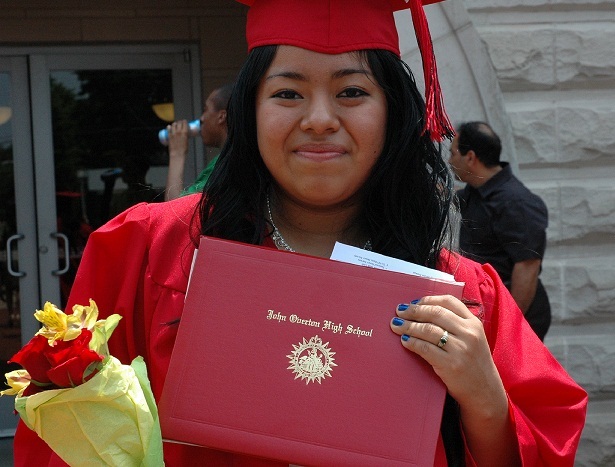 A 1996 law says that Mercedes' love for Nashville, her good grades, and her overall good behavior can't factor into an Immigration Court's decision on where Mercedes should live, so the group that is graciously providing Mercedes with a lawyer is hoping that the prosecutor exercises discretion - also known as deferred action - in Mercedes' favor. My plans are that I am going to be a doctor. I am working on going to college. I have always liked to help people and the community. 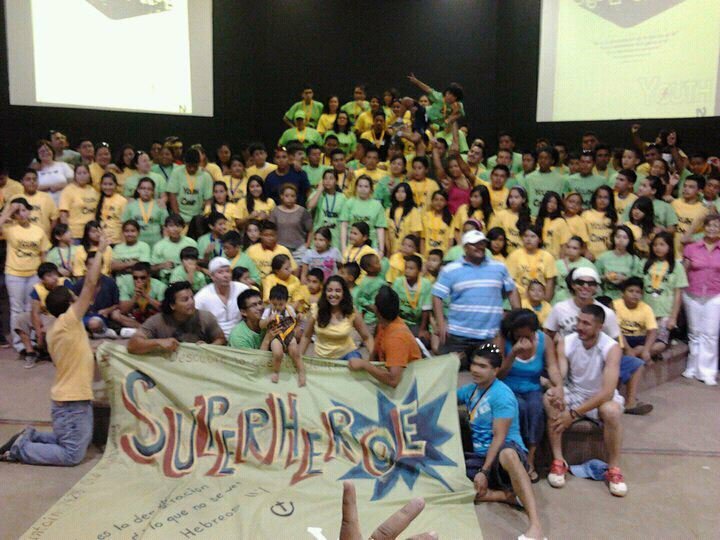 If I go back to Mexico my future wouldn’t be the same, my life it’s here, my friends, my family I love being here and I am just a normal person wishing to have a better future not just for me but also for the people that are going through the same situation. Yes, I had my student I.D., but the officer didn’t accept it. So that was the Metro Nashville P.D. 's opinion of a public school education. The sheriff's office, for its part, got a chance to offer its opinion of that same subject - twice. We’re leaving it here for now, but it will be discarded at some point. Mercedes Gonzalez, now without her Overton graduation cap, still loves Nashville. Carrie Ferguson-Weir is blogging over at Bilingual in the Boonies again. 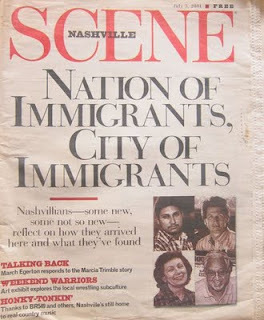 Ten years ago, before 9/11, the July 5, 2001 issue of the Nashville Scene launched a feature called, "Nation of Immigrants, City of Immigrants." The subhead read, "Nashvillians--some new, some not so new--reflect on how they arrived here and what they've found." Independence Day is a perfect day for these reflections. In the Declaration of Independence itself, our founding fathers complained of the King's "obstructing the Laws for Naturalization of Foreigners; refusing to pass others to encourage their migrations hither." Today, the Tennessean is joining in the fun, as it has in previous years. Starting from this feature story, four newly minted U.S. citizens tell how they became officially American, including Maria Arbelaez-Lopez, born in Colombia; Alonso Luna, born in Zacatecas, Mexico; and two others, one born in Somalia, and another born in the former Soviet Union. The Tennessean stories are great to read, and if you like those, you'll get even more out of the 2001 Scene stories. I'll tease you with a couple of excerpts below. You can read the stories in their entirety by clicking on the links to the titles of the stories, or by going straight to the table of contents. I feel poorer today for not knowing what courage, pluck, hope, and fear it takes to depart an old home in search of a new one. Perhaps that’s why, with a hearty respect, I watch the tidal ebb and flow of people into and out of Nashville. From the limited perspective of headlines, Nashville’s present immigration experience appears novel, unusual, even sometimes disconcerting. Yet my own family’s story reminds me that in some respects the experiences of today’s newcomers are scarcely different from those of yesterday’s earlier arrivals. "Fernando and I don’t smoke or drink, and we go to the Pentecostal Hispanic Church of God. The other members let each other know where jobs are and keep us informed of any important immigration news, as well as word of any disasters in our home countries. When I’m not working, I like to watch soccer or go to the movies, which I think are expensive. We like to go to Opry Mills or Hickory Hollow. At the malls, we’re always scamming on women. We have Web TV, and I’ve chatted with a few women on the Internet. I called women who lived in Pennsylvania and Oregon, but I haven’t met anyone yet. I would like to get married to an American and live here." There are also stories in the Scene of Ukranian and Italian Nashvillians. HispanicNashville.com joins the Scene and the Tennessean in wishing you and all of our American neighbors a Happy Fourth of July. 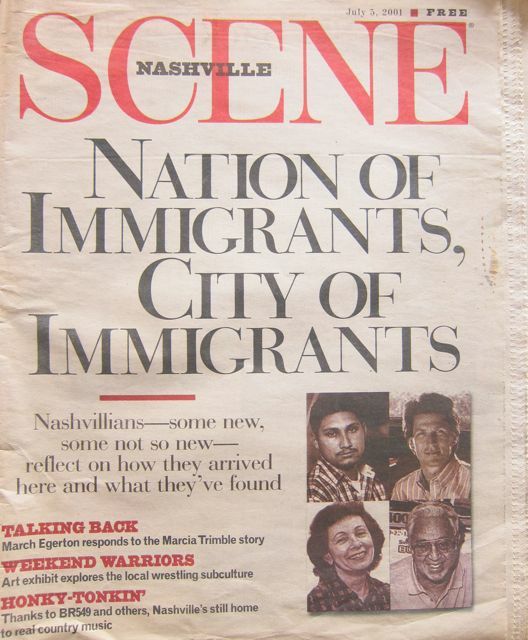 Many loud cheers to the Nashville Scene for that issue in 2001 and for its more recent coverage of immigrant and immigration stories, including Brantley Hargrove's encyclopedic review of the local-federal enforcement bureaucracy known as 287(g). A few more loud cheers to the Scene for its online story archive, where old stories stay alive and accessible, in contrast to City Paper and the Tennessean, whose archives that old have long since crumbled into error messages.